Details are still emerging about an attack carried out near the UK’s Houses of Parliament on Wednesday. As officials try to determine the identity of a suspect who was shot by police, a 4chan thread from less than 24 hours earlier appears to announce the location of the attack that has claimed five lives so far. Shortly after the attack, 4chan users began speculating about a post from yesterday that seemed to reveal the attacker’s plan, worrying that its existence would lead to the site being shut down. 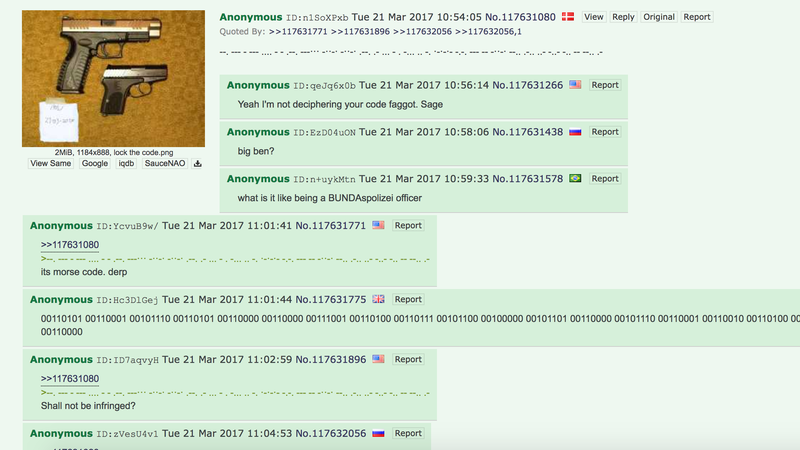 The announcement, posted at approximately 3pm London time on Tuesday, appeared on the site’s politically incorrect (/pol/) imageboard from a user with the ID n1SoXPxb—the only post by that ID across any 4chan board. The user is flagged as Danish, though they could have easily used a VPN to obfuscate their location. The user posted a string of Morse code dots and dashes which translate to “gotohttp://pastebin.com/zluxdmza.” That Pastebin page contains a simple binary code which, when deciphered, points to a GPS location near Big Ben, close to where the attacker reportedly crashed his vehicle on Wednesday. Because the Pastebin page was created by a guest account, it could not have been changed after the fact. Additionally, /pol/ users responding at the time of the thread’s creation noted then that the code referred to England’s famous clocktower. That Pastebin file has been viewed nearly 4,000 times at the time of this writing. The possible assailant’s Pastebin post. The user attached a photo of two guns taken from an unrelated 2010 forum post with the phrase “/pol/ 21-3-2017” crudely edited into the image. It’s currently unknown if the suspect had a firearm, but the post’s threatening intent is clear. The attack itself is currently being treated as an act of terrorism, according to The Guardian. Witnesses have described the assailant as an Asian man in his 40s. Update 3/22/17 7:01pm EDT: Currently there are five reported deaths from the attack and 40 injuries, the New York Times reports.